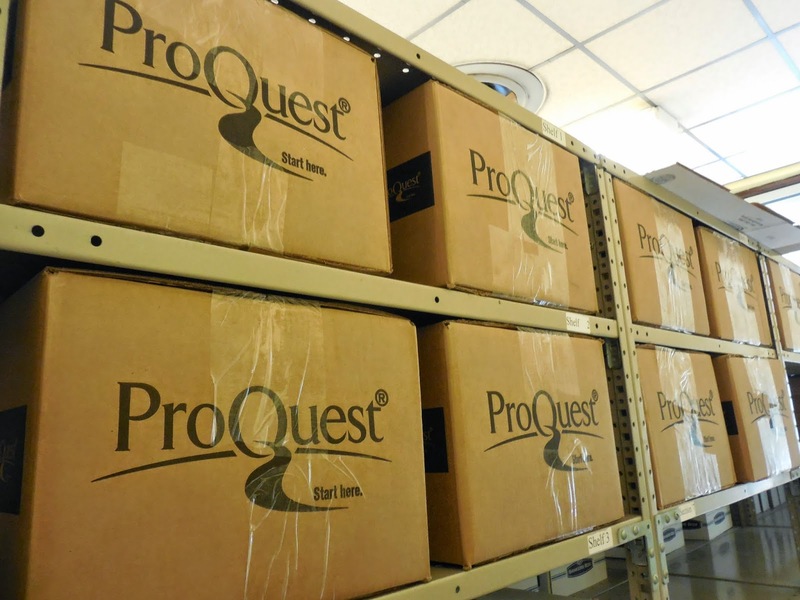 Last week, University Archives received a return shipment of 1/4 ton or 531 pounds of paper dissertations (plus the wood shipping pallet) from ProQuest. ProQuest is the publisher the University of Kentucky Library uses to microfilm our paper dissertations. Over 700 universities participate in ProQuest's theses and dissertation's database, which started in 1938. This allows the scholarship of UK's doctoral students to be searched and discovered side-by-side with many other theses and dissertations across the world on the same or similar topics (www.proquest.com/products-services/dissertations/; regarding polar bears and eyeballs, see weirdconverter.com). These 531 pounds (14 boxes--paper is heavy!) represent the end of an era, because they are the last print format dissertations produced at UK. For more than 100 years, from 1896 to 2000, UK masters and doctorate graduate students submitted their theses and dissertations in typed print format. (The typewriter was invented the 1860s.) From 2000 to fall 2013, students could submit either print or electronic versions of their culminating work. However, starting in Fall 2013, the Graduate School has required that students submit their theses and dissertations electronically only. All of UK's electronic theses and dissertations can be accessed through the library's on-line, open access repository for student, staff, and faculty scholarship, UKnowledge (uknowledge.uky.edu). UK's theses and dissertations are a permanent university record that document both the scholarship of the University and certify that the individual student has completed their graduate course of study. The University Archives thus preserves all the print theses and dissertations in our closed stacks. There is also an access copy in the main library. Use our library on-line catalog system, InfoKat, to locate all our theses and dissertations (infokat.uky.edu; put the word "theses" into the call number search field).